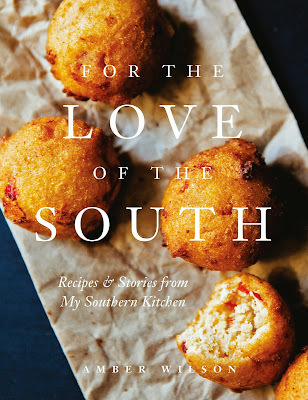 Brooklyn Digest: Books: Cooking "For The Love Of The South"
Amber Wilson, who created the acclaimed food blog For the Love of the South, has just published her first cookbook, which is a delightful collection of 100 amazing and accessible recipes for Southern classics. For The Love Of The South: Recipes And Stories From My Southern Kitchen captures the essence of Southern culture and honors family, friends, food, and Wilson’s experience growing up on the bayous of Louisiana. Wilson also made added a very unique, personal touch as she took all the pictures of the dishes herself. Amber Wilson. Courtesy of the author. Wilson's culinary skills and her quintessential ability to tell engaging, entertaining, and eloquent stories about her Southern childhood have made her incredibly popular on social media, with 178,000 Instagram followers, 56,000 fortheloveofthesouth.com followers, and 7,000 Pinterest followers. A self-taught home cook, Wilson has an insatiable desire to honor the culinary culture of the South as well as to create new dishes. Once on a career path in science and offered a job at NASA, she decided to change course and start her blog, For the Love of the South. An homage to her Southern roots, the blog was a finalist in Saveur’s Best Food Blog Awards and was one of PBS’s Best Food Blogs. Wilson was also one of Southern Living’s “30 Bloggers You Should Be Following.” She has partnered with chefs such as Virginia Willis, and Emeril Lagasse. She lives in Nashville, Tennessee, with her husband, Michael. Part of the beauty of Wilson's dishes is that, no matter where in the country you live or how much of a novice you are in the kitchen, she teaches you how to master many Southern dishes, from starters to desserts. The recipes feature inexpensive, readily available ingredients and come with instructive, encouraging directions. Learn to make a roux, perfect the popover, fry okra, lattice a piecrust, and create irresistible gumbos and jambalayas like a true Southerner. From Pain Perdu, Pimento Hushpuppies, Corn Bisque, and Spicy Oven-Roasted Okra to Tomato and Bacon Sandwich with Chipotle Mayonnaise, Nashville Hot Chicken, Cajun Jambalaya, and Bacon-Latticed Apple Pie, there’s something tasty for everyone. There is a pantry-full of time- and money-saving kitchen tips in the section of the book called “Kitchen Wisdom." Wilson offers ideas on storing and freezing bacon to prolonging fresh berries in the fridge, seasoning cast-iron skillets, and making vanilla extract, as well as providing helpful do-ahead and leftover-saving tips for many recipes. Wilson writes of her Kitchen Wisdom, "The kitchen has taught me many things about life, and the greatest guidance I've been given is that preparedness and peace go hand in hand. Preparation and planning help keep my sanity on days when I'm too busy to cook or exhausted to stand upright. This is how I cook and live, but at the same time I don't restrict myself to rules or a strict routine, and I don't want you to either. These are suggestions, not orders. Let's be honest, one of the greatest advantages of a home cook's kitchen is that it's one of the only places where complete self-regard is greatly rewarded and guiltlessly pleasurable." This is an artfully done cookbook with easy-to-make recipes that Wilson wants you to really use. “I hope there are blackberry juice starbursts splattered across the pages, dog-eared corners, and handwritten notes in the margins," Wilson writes in the introduction. "Above all, I hope you find comfort in these recipes and make them your own." "During the long, hot summer months, our backyards were treasure troves of edible gems. A portion of each neighbor's yard was a garden of sorts, revealing characteristics of its caretaker. Some gardens overflowed with herbs and spring onions in simple clay pots, others with emerald green bell pepper plants in perfectly straight rows. The more adventurous gardeners had a few chickens strutting about their yards, feasting away on herbs and fallen vegetables. Then, there were those who created raised vegetable beds out of old barbecue pits and tractor tires. "I remember tending to our backyard garden with my mom when I was a little girl. One night, I sat in the dirt next to the cucumber plants as we began snipping a few green onions for our dinner. I couldn't help but stare at the perfectly ripe cucumbers suspended in midair, reminding me of sausages hanging in a meat market. I looked under one of the jade leaves and spotted a small cucumber with a bright yellow flower attached at one end. A crack of thunder in the distance broke my focus. Tomato plants swayed in the breeze and drops of cool summer rain began hitting our cheeks. 'Be sure to peek at this one in the morning,' Mom said with a knowing smile. Before it began pouring, we rushed inside with fists and arms full of green onions and cucumbers. I thought no more of the tiny cucumber and continued helping to prepare for dinner. "The next morning, I walked outside to gather a few tomatoes and herbs for breakfast. I remembered what my mom told me about the baby cucumber, so I began folding the leaves back, and, lo and behold, the teeny cucumber grew half the length of my forearm overnight. I couldn't believe it! From that moment on, I thought of cucumbers as being enchanted. They appear mystically in our garden patch after a midsummer storm and disappear just as magically at our table." A slice of Southern hospitality, this book is a beautiful production and definitely worth adding to your cookbook collection.